TEACHER WELLBEING: FLOURISHING IN SCHOOLS BY NOTICING, NURTURING, AND SUSTAINING. Grounded in research that explores flourishing schools and positive educational leadership, this book advocates for much more attention on teacher wellbeing. Offering a blend of theory and practice, this book is written to engage teachers, groups of teachers, and school leaders in conversations that help make sense of the often overwhelming demands inherent in teaching, the accompanying challenges of these realities, and their impacts on teachers’ wellbeing. The authors argue that as teachers foster the wellbeing of their students, they must ensure that their own self-care is a professional priority. 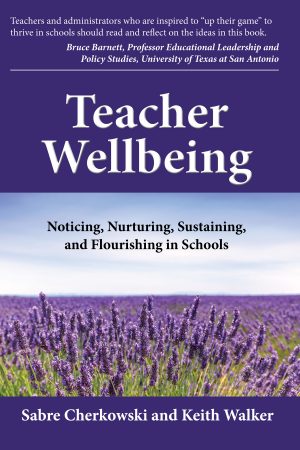 Some Reviews of Teacher Wellbeing: Flourishing in Schools by Noticing, Nurturing, and Sustaining. What educator would not want to work in flourishing school environment? However, changing the narrative about the realities of teaching is no easy task, especially when much of what is we read are the unrelenting workloads, selfdoubt, stress, and burnout teachers experience. Fortunately, Cherkowski and Walker provide a blueprint for reframing the narrative about teacher wellbeing, focusing on how growth mindsets, appreciative inquiry, hope, and resilience can sustain a flourishing school culture. Teachers and administrators who are inspired to “up their game” to thrive in schools should read and reflect on the ideas in this book. Cherkowski and Walker have tackled a very important area - the combination of theory and practical strategies about educator wellbeing make this book one to add to your professional collection. This book challenges much conventional thinking about what it takes to improve schools, balancing theory from several disciplines with stories from schools and practical guidance. A refreshing addition to the literature and an uplifting read. Dr Louise Stoll, Professor of Professional Learning, UCL Institute of Education, London.